Evergreen’s Oral History group from left: Larry Eickstaedt, Sam Schrager, Nancy Taylor, David Marr and Ernest “Stone” Thomas. 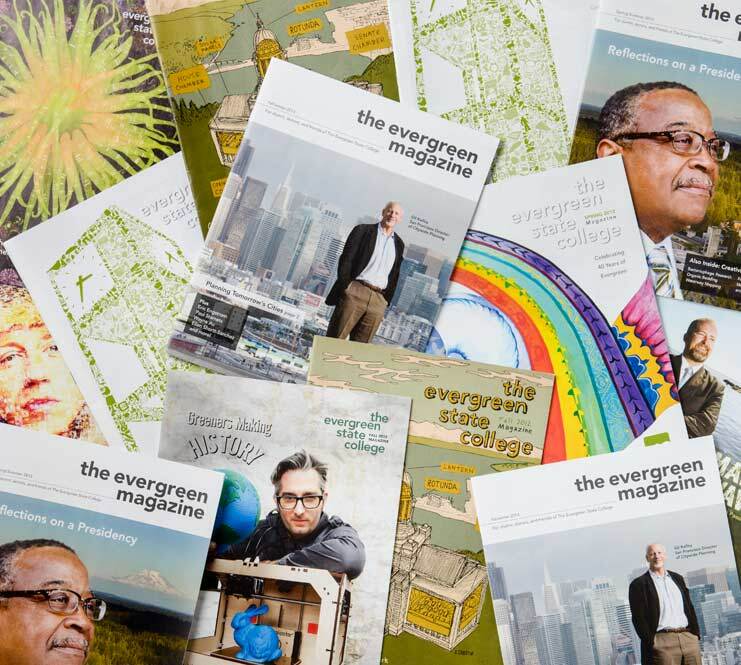 “One of Evergreen’s hallmarks is the depth of connections faculty, students, and staff have forged by studying and working together,” said Sam Schrager, the faculty emeritus leading the Evergreen Oral History Project, a collection of audio and transcribed stories from individuals who helped form the college. Supported by a $120,000 anonymous donation, the Oral History Project hopes to archive and encourage engagement with Evergreen’s rich and storied past. The vision is to include alumni voices as well, and to provide opportunities for the wider Evergreen community. Once the project is complete, a published compilation of the transcripts will become available, as well as podcasts online. Faculty member Nancy Koppelman ’88 is one of the interviewers, and has been working closely with Schrager to compile and disseminate the information they are collecting. “Ideally the interviews will offer a fascinating and complex picture of the college, starting from the beginning, through stories from a range of people who have been part of the community,” she said. For example, Nancy Taylor was the first admissions counselor in 1971 and later joined the faculty. Taylor was instrumental in the college’s success—she directed outreach in high schools, community colleges, shopping malls, Indian reservations, and community centers across Washington. So faculty found other places. He remembers one program met downtown in the legislative building, while Eickstaedt found a Girl Scout camp on Hood Canal.